Fast DVD Ripper Software Review | Which DVD Ripper can Rip DVD at Fast Speed? "I have just downloaded HandBrake for the purpose of ripping DVD to MP4. But when I try and rip a two and a half hour DVD, it says it will take 5 hours! What’s wrong? If DVD ripping takes longer than the actual movie length, it's really a waste of time. Any fast DVD ripper recommended?" There are a large number of DVD rippers available online, but some of them require quite a lot of time to finish DVD ripping, even up to hours. Nobody would like to spend too much time to rip and copy DVD, right? So, here we'll throw out a fast DVD ripper and review it side by side. WinX DVD Ripper Platinum features World's No.1 fast DVD ripping speed. It can acheive up to 32x real time faster, 500 FPS maximally (decided by the speed of DVD drive). 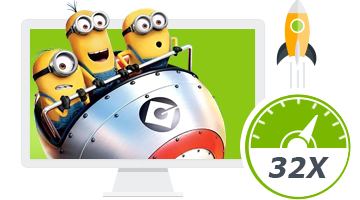 What makes it a fast DVD ripper is that it supports hardware acceleration, Multi-core CPU (up to 8), Super Encode Engine based on MMX- SSE & 3DNow! and Hyper-threading tech. In this part, we will focus on reviewing WinX DVD Ripper Platinum which claims to feature No.1 fast DVD ripping speed. Is it really a fast DVD ripper? Any proofs? 1. Fast DVD loading and main title selecting. WinX DVD Ripper Platinum can read and load any DVD you throw to it quickly, be it a home-made DVD or a tightly copy protected DVD released by Disney, Paramount, etc. And it can load the DVD video information and detect the DVD main title at one go. Obviously, it saves you much time to figure out the correct main title. Some DVD ripping software like HandBrake can't recognize encrypted DVDs. Some DVD rippers are unable to detect the correct main title. 2. Allow users to fast specify an output. After selecting the main title, this DVD ripper will pop up Output Profile window automatically to prompt you to specify an output. There are hundreds of preset profiles ready for you, helping fast rip DVD to MP4, AVI, MOV, iPhone, iPad, Android, Sony, Microsoft, etc. You can fast find out the output profile you desire from the well-organized categories. Superior to HandBrake and some DVD rippers in the market, it won't require you to set profile and adjust video audio parameters to get better output. Everything has been optimized. WinX DVD Ripper Platinum can be marked as a fast DVD ripper, mainly due to its fast DVD ripping/encoding speed. And its fast DVD ripping speed is guaranteed, owing to the support for hardware acceleration wiki [Intel QSV and NVIDIA (CUDA) NVENC], Multi-core CPU (up to 8), Super Encode Engine based on MMX- SSE & 3DNow! and Hyper-threading technology. It is able to convert a feature-length DVD in a matter of minutes while keeping high video audio quality. It is also worth noting that it is possbile to rip DVD to MP4 within 5 minutes only. According to a test on a 64-bit Windows 7 PC with Intel(R) Core (TM)2 Quad CPU Q8300 and 8GB RAM, the conversion frequency of WinX DVD Ripper Platinum is 170 fps when selecting AVI as the output format. When working on a PC with i7-4790K Processor and 16GB RAM, it can achieve up to 260 fps when choosing H.264 codec. That's 3x to 5x faster than many DVD rippers under the same testing condition with the same settings. Undoubtedly, it can be included in the list of fastest DVD rippers. How to Use This Fast DVD Ripper for DVD Ripping/Copying? To begin with, download the fast DVD ripper on your Windows (10, 8.1/8, 7, XP, Vista, etc.) computer, install it following the wizard. For Mac users, please download fast DVD ripper Mac version here. After that, simply follow the steps below to perform fast DVD ripping. Step 1. Insert DVD to DVD-ROM, and click "DVD Disc" to import DVD. Step 2. Select an output profile as you like. Step 3. Specify a destination folder to store ripped DVD video by clicking "Browse". Step 4. Hit "RUN" to begin ripping DVD. Disclaimer: Digiarty Software does not advocate copying copy-protected DVDs for any commercial purpose and suggests referring to the DVD copyright laws in your countries before doing so. If you want to keep a fast DVD ripper that can rip both regular and protected DVDs to all popular video audio formats and fashionable devices, 1:1 clone DVD to ISO file/DVD folder as well as copy main/full title content to MPEG 2 file, WinX DVD Ripper Platinum is worth a try.